system. Parallel folding can be operated for two times with the buckle plate. Its mode of folding includes parallel fold, concertina fold and letter fold. Vertical folding can be operated three times in combination of the buckle plates and the knives. 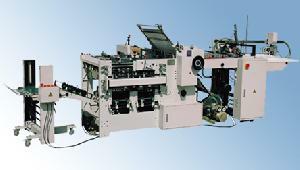 Perforating, creasing and slitting can also be operated during folding process as required. The third vertical folding can be operated for positive folding or negative folding as required by adjusting sheet turning device. The functions of 32mo two-up positive folding or negative folding are provided as customed.